Incoming Bishop Larry Silva, left, was aided yesterday by Monsignor Terry Watanabe at the Honolulu Catholic Diocese. Silva, who has been the vicar general of the diocese of Oakland, Calif., since 2003, was born on Oahu and has a large extended family and many friends here. 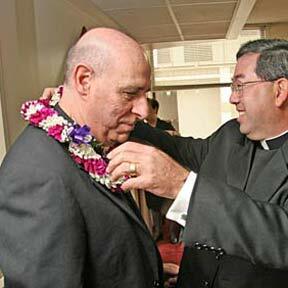 He was appointed by Pope Benedict XVI to fill the Honolulu post, which has been vacant for a year.